Women’s Haircut –$40+ Our hair services are 100% bespoke, since no two heads are the same! Bangs and bobs, short and long, curly and straight, thin and thick, coarse and fine, frizzy and smooth, pixie and layered, blunt or razored, we do it all! Your hair may require a wet or dry cut, or both. No matter what, we always give each client the absolute best. Every appointment includes a consultation, the best scalp massage in the universe and a cut and style that will turn heads. Approximately 1 hour, depending on length of hair and style. Men’s Cut – $25+ This is not your typical 5 minute haircut. Just because you’re a man, doesn’t mean you aren’t entitled to the same, meticulous and pampering experience we give to women. Details are important so each haircut includes our signature scalp massage as well as a post-cut mini styling tutorial, to ensure you’re able to replicate your style beyond our walls. Approximately 30 minutes. Children’s Cut -$20+ We count among our clients some of the most stylish kids in Indiana. From the shy 2 year old, the fascinated 3 year old, the Princess Elsa obsessed 4 year old and beyond, we work swiftly to give them the best experience and the coolest hair. And yes, they get our signature scalp treatment too! Approximately 15 – 30 minutes. 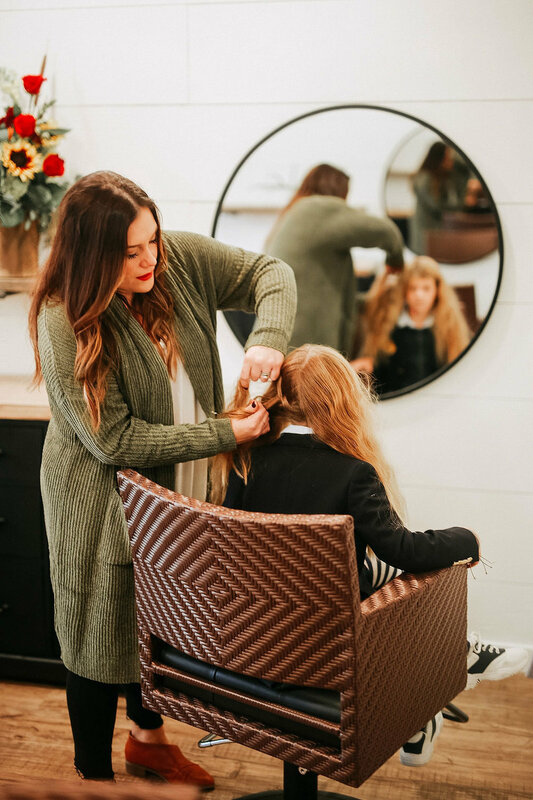 Shampoo & Style –$40+ Who needs a blowout bar when you have Salon Renew? Blowout, sleek waves or bouncy curls, you’ll be treated to our signature scalp massage and a styling session. You’ll leave with swoon-worthy hair! Approximately 45 minutes – 1 hour. Special Occasion Style – starting at $80 (on location fee starts at $250)-Wedding, prom, hot date? We’ll give you style in spades that’ll give any red carpet celeb a run for her money. Approximately 1 hour. All-Over Color –$105+ Covering greys or adding shine to your natural tones, all-over color can be just the pick-me-up your tresses need. Approximately 2 – 2.5 hours with cut/trim, style/blowout. Color and Highlights –$115+ From ombre to balyage, from natural to neons, we can give your hair gorgeous, envy-inducing color. Approximately 2 – 2.5 hours with cut/trim, style/blowout. Color Retouch –$85+ Banish those pesky gray strands, dark roots or ashy new growth with our retouching that only covers new growth and includes our signature scalp massage. Approximately 1 ½ hours with cut/trim, style/blowout. Corrective Color – Price quoted at time of consultation. Did you have an ugly run-in with an at-home color box or a colorist at a different salon? No matter the debacle, we can help restore your hair color. Because one solution does not fit all, a consultation to determine price and approximate time is necessary. Global Keratin Treatment – starting at $200. We’ve dedicated ourselves to finding the absolute best keratin treatment on the market. This treatment will relax hair and cut down on frizz, making hair shinier, more manageable. Be forewarned: You must wait 48 hours before shampooing hair, getting it wet, using any rubber bands or bobby pins, wearing hats or sweating – all of which can interfere with your results. The good news? If you’re looking for an excuse to skip a workout, this is it. Approximately 1 – 2 hours, depending on length of hair, texture and density. Custom Hair Extensions- starting at $150. We offer custom matching tape-in or clip-in extensions. Whether you just wanted added volume, length, or even a fun color we can give you the look you are wanting. Top of the line real human hair makes styling and maintaining your extra locks easy. A consultation will be set up to determine your needs.